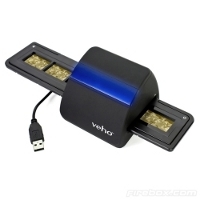 We’ve seen an old Veho Film and Slide Converter a couple of years ago, but here is an updated version – the Veho Colorbright Slide/Negative Scanner which will inject new life into your catalog of old memories. In fact, it is touted to be a quick and easy method to convert your collection of old photos into versatile digital images. The VFS-002M will scan your old 110mm and 35mm negative slides and films onto your Mac or PC via USB, providing a quick and easy way to convert your old photos into versatile, digital images. Once transferred to your computer you can edit, archive and print using the photo editing software included. The setup could not be easier as no software is required for installation. What’s more, this new deluxe version comes with multi directional insert tray flaps and faster one touch scanning – just plug and play! The new VFS-002M also includes Colorbright technology that increases the clarity of scanned images by automatically adjusting the back light and colour balance according to the subject matter. Transform your old faded negatives and slides into bright, crisp and clean digital images. Would you fork out £59.95 for this? Needless to say, the scanning part would be an extremely tedious process, but that’s what kids are for right? Pay them a few quid to get your catalog of photos scanned, and you’re good to go. Of course, this doesn’t include the sniggers that come along with them seeing what you wore back in your youth, flared bell bottoms and all.